One of the most complex disciplines in electrical engineering is power system protection which requires not only the proper understanding of the different components of a power system and their behaviours but also a good knowledge and analysis of the abnormal circumstances and failures that can occur in any element of a power system. Moreover, the rapid changing and development in relays principles as well as in their technologies are additional factors that oblige those people working in the field to expand and update continuously their knowledge. In this paper, we shed light in the evolution of protective relays since the onset of electrical energy to currently. We try also to foresee the future prospects and trends in this area. Protective relaying is an integral part of any electrical power system. The fundamental objective of system protection is to quickly isolate a problem so that the unaffected portions of a system can continue to function. Protective relays are the decision-making devices in the protection scheme. These relays underwent, through more than a century, important changes in their functionalities and technologies. Each change brings with it odds and improvement in both technical and financial aspects. In this paper, we shed light in the evolution of protective relays since the onset of electrical energy to currently. We try also to foresee the future prospects and trends in this area. Since the early days of the onset of electrical power the need of devices to prevent or limit the undesirable events in power system have been prescribed. 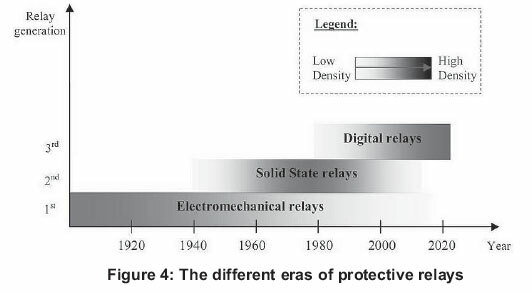 The history of protective relays refers to more than a century ago. Some literatures say that the first protective relay was produced in 1902 (Singh, 2007; Pathirana, 2004), others refer to 1905 (Lundqvist, 2001; Rebizant et al., 2011). But whatever the date, the hard fact is that protective relays knew an important revolution since the beginning of the twentieth century. 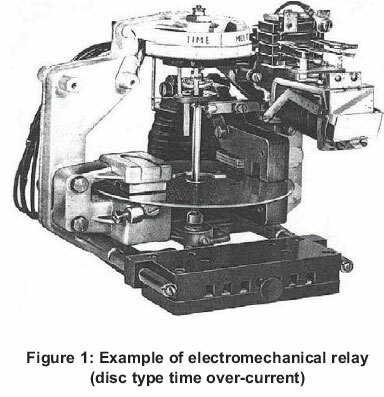 In 1909, induction disk type inverse time current relays came into practice and the concept of directional discrimination of faults was incorporated in these protective relays (Singh, 2007). Differential relay was developed using pilot wires for conveying information from one end to the other end of the line (Pathirana, 2004). In 1923, distance relay appeared in the form of impedance. Later, the induction type mho relays with very high precision came into practice. After that, polarized dc relays with better accuracy and sensitivity were developed in 1939 (Singh, 2007; Warrington, 1968). All of the relays developed until the 1940's were electromechanical relays. These devices achieved very high precision and sensitivity in the form of induction cup mho relays and perform well for the missions attributed to them. The early 1940's showed the way into the development of relays using electronic devices (Singh, 2007). These relays are known as static relays or solid state relays because they didn't contain a moving parts. The advent of transistor circuits opened the door to the development of several new protection concepts like block spike comparator, phase comparator, etc. The major advantage of these relays was that no moving parts were needed for performing their intended functions. The operating speeds of these relays were also more than the speed of their electromechanical counterparts and, their reset times were less than the reset times of electromechanical protective relays. In addition to these benefits, the solid-state relays could be set more precisely (Sachdev et al., 2009). This generation of static relays became quickly very popular and found a large place in power system protection. 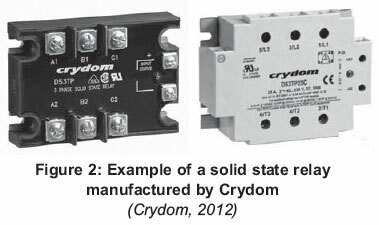 During the peak famous period of these solid state relays, another generation of protective devices was being set in way to see the light; it was the digital technology. The use of Digital computers and microprocessors for protective relaying purposes has been engaging the attention of research since the late 1960s (Singh, 2004). The first serious proposals for using digital computers came from Rockefeller in 1969 (Rockefeller, 1969; Singh, 2004). Much literature reported digital relays shortly afterwards. But the first microprocessor based relays offered as commercial devices was only in 1979 (Sachdev, 1979). In that era, the efforts were concentrated to obtain a very high speed fault clearance. Different techniques and algorithms were proposed for achieving this objective. These include common hardware platforms, configuring the software to perform different functions (Sachdev et al., 2009). 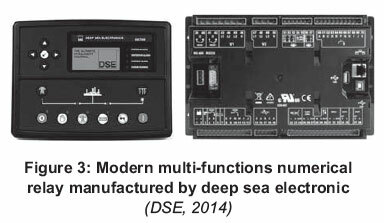 In the late 1980s, Multifunction digital relays were introduced to the market (Sachdev et al., 2009). These devices reduced the product and installation costs drastically and has converted microprocessor relays to powerful tools in modern substations. In 1988, the Virginia Tech research team developed the first prototype phasor measurement unit (PMU) based relay (Phadke, 2002). This technique allows measuring, beside the magnitudes of the electrical entities, the phase angles (Zhang, 2010) and could offer new information that can be used to improve the functional logic of protective relays. In the 1990s, the notion of integrated protection and control became very popular and benefited full advantage of microprocessor technology, for protection, monitoring, control, disturbance and event handling, and communication. The relays' volumes as well as wiring were significantly reduced due to the integration of functions and the use of serial communication. Perhaps the most attracting feature of these numerical relays was the ability of communication that offered new horizons for protection and protection related applications. At the present time, there are many advanced communication techniques which can be used to improve protection, control, speed outage restoration, operation analysis, maintenance functions and planning. This communication facilities allow engineer operating, testing, maintenance and accessing real-time and historical relay information to the neighbours (Wang et al., 2002; Eissa, 2002). The information is the basic constituent in the protection scheme. The important issue is communicating and processing information in an efficient and economical way. The key element in a communication system is the physical medium used in conveying information through the system. There are many different types of communication media such as twisted pair cable, coaxial cable, fibre optic cable and wireless communication (Ali et al., 2007). The wireless networks are by far the most popular choice for new network algorithm. Nowadays, modern digital relays draw on the experience and technical resources of the previous series and also featured compactness and less power consumption along with support for remote operation based on enhanced communication functions. The use of global positioning system (GPS) for digital measurement, especially for overhead line protection, gives very encouraging results. They are more accurate than distance relaying algorithms which are affected by inadequate modelling of transmission lines and parameter uncertainty due to line aging, line asymmetry and environmental factors (Bo et al., 2000). The use of GPS technique allows providing time synchronization to± 1µs accuracy (Radojevic' & Terzija, 2007) a thing which proves the high precision character of this technique. In fact, the accuracy of relays depends not only on their hardware components but also on the manner of information processing to evolve the decision signal; this is what is called the data processing algorithm or the processing method. So, the research of the optimal method to obtain the most accurate decision in the fastest way is one major challenge in the numerical protective relay design. Over the past two decades, the application of the artificial intelligence methods on power protection relaying (ANN, Fuzzy logic, genetic algorithms...) is under investigation. Perhaps the most wonderful aspect in artificial intelligence techniques is the ability to learn by training any complex input/output mapping and recognize the noisy patterns. These techniques have been quite successful but are not adequate for the present time varying network configurations, power system operating conditions and events (Babu et al., 2011). While all these functionalities and characteristics of numerical relay make it a magic solution for protection system; some specialists and experts expressed their anxieties about the reliability and the lifetime of these new relays. Thus, the lifetime of old electromechanical relays can exceed 40 years, some of them were performed in service for more than 50 years. Whereas that of the numerical relay is estimated between 10 - 15 years (Gurevich, 2012). This is a result of the ageing of their electronic components, bringing on changes in their parameters, during their lifetime. For example, the service life of electrolyte capacitors, which are widely used in microprocessor based relays, does not exceed 7-10 years (Gurevich, 2009), and this is under favourable conditions of temperature and humidity. From the viewpoint of reliability, a statistical study (between 2000 and 2009), posted by A.N. Vladimirov., Deputy Head of Relay Protection Department of Central Dispatch Service of UES of Russia, showed that the reliability of microprocessor based relay is about 60% less than that's of electromechanical relay (Vladimirov, 2009; Gurevich, 2010). The high accuracy and precision of numerical relays (NR) compared with electromechanical relay (EMR) are counterbalanced by its weak immunity against electromagnetic perturbations. 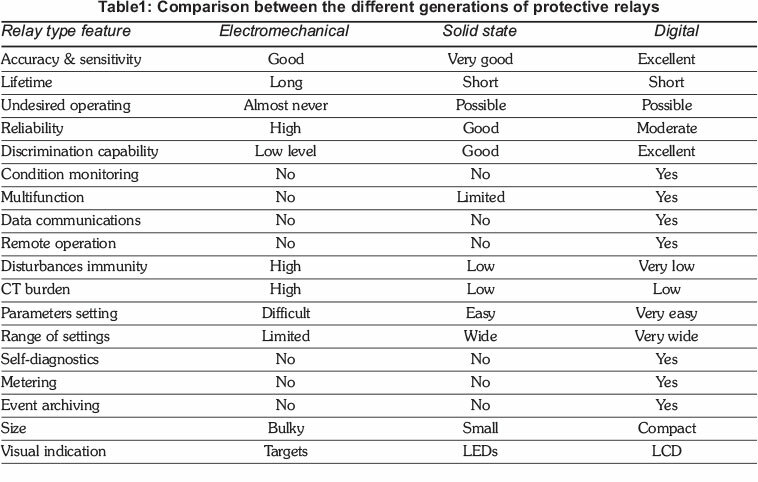 Table 1 shows a comparison between the different generation relays. The previous cited problems of NR are the important titles' debated in this field. But whatever the matter, we guess that these problems are issues of risk control. And once the risk is well identified and properly assessed, it is just enough to take it into account and to plan making the necessary actions in the good instants. For example, if we are sure enough that the lifetime of a digital relay is 10 years, we must foresee its change after ten years minus epsilon , we should, also, be careful in its last years of service. So, after identifying the weak points of the protective relay; it will be clear where one must focus the efforts to reduce the failure risk and, consequently, improve the reliability of the relay (Abdelmoumene & Bentarzi, 2012). The use of the redundancy technique (back up element) allows a significant reduction of failure rates, and hence improving the reliability of the considered protection system (Abdelmoumene & Bentarzi, 2012). Nuclear power plants (NPPs) traditionally relied upon analogue instrumentation and control systems for monitoring, control, and protection functions. With a shift in technology from analogue systems to digital systems with their functional advantages (e.g., fault-tolerance, self-testing, signal validation, and process system diagnostics), plants have begun such replacement. However, digital systems have some unique characteristics, such as using software, and may have different failure causes and/or modes than analog systems; hence, their incorporation into NPP probabilistic risk assessments (PRAs) entails special challenges (U.S.NRC, 2011). At any rate, it is inevitable that power plants will slowly move toward newer technology. In fact, this movement toward the use of digital/numerical type relays has already begun. In 2004, some U.S. nuclear plants had already installed digital relays for selected applications (EPRI, 2004). Japanese and French power plants had also begun testing these new technologies in their nuclear power plants (NPPs) (IAEA, 1999; Hashemian, 2011). Throughout this paper, an historical background of protective relays has been presented. The latest developments and trends have been also introduced and discussed whether for hardware and technology aspect or software and method aspect. The performance evaluation and comparison between the different relays generations have been done in order to bring out the strong and the weak points of each relay type. The relatively low reliability level of new numerical relays constitutes the major worry expressed by many experts in the protection field. In our opinion, the wonderful achievement in performance and functionalities enhancement brought out in numerical relays must be completed by the research to increase significantly the reliability level and mastering the risk assessment. This paper is the result of great efforts during a long time of research in specialized literatures to establish an exhaustive document which resumes the main highlights in protective relay's developments and trends. The authors acknowledge the immense help received from the scholars whose articles are cited and included in the references of this manuscript. The authors are also grateful to authors / editors / publishers of all those articles, journals and books from where the literature for this article has been reviewed and discussed.